This page includes news "common" to the V-Club and is not "region" specific. News that is deemed to be of interest to all members of the V-Club regardless of where they are physically located is published here. Nearly four years after the luxury car brand moved its headquarters from Detroit to the fashionable SoHo district in New York, representatives at General Motors have announced that Cadillac will make its move to Warren. The initial move to New York was made with the intention of creating greater autonomy for the Cadillac brand to operate. However, with thousands of Cadillac employees still based in Michigan, that wasn't so easy. According to the Wall Street Journal, the luxury brand still relied on decisions made by Michigan employees – everything from style designs, vehicle features, and even pricing. This decision comes after the departure of Cadillac's former head, Johan de Nysschen. Mr. de Nysschen who formerly worked Volkswagen AG’s Audi of America was said to not have an aligned vision with Detroit-based GM executives, causing disputes. Under de Nysschen, Cadillac sales began to slump in the U.S., falling behind luxury car competitors like Audi and BMW. Cadillac's current New York headquarters house roughly 110 employees – mostly executives and marketing personnel. Carlisle says that the new headquarters will be based in a renovated space in Warren, near the GM technical facilities where thousands of Cadillac's engineering and vehicle design employees are already based. Cadillac Detours will be in North Dallas this weekend. Take a drive in the 2018 Cadillac of your choice and receive a $25 Nebraska Furniture Mart Gift Card that you can use instantly. Cadillac Detours will be located at the Center Entrance. Stop by anytime during our open hours, no registration required. For further questions check out our FAQ. Cadillac President Johan de Nysschen is leaving General Motors and will be replaced by the head of GM Canada, Steve Carlisle, the company said Wednesday. As head of the Cadillac business and a senior vice-president of the parent company, Carlisle will report to GM president Dan Ammann. The automaker also named Travis Hester as the new president of GM Canada. Hester is currently vice-president of GM’s global product programs. Carlisle has been at the head of GM Canada since November 2014. Carlisle led a resurgence of the GM Canada franchise, the company said. The automaker led retail auto sales in Canada last year, and Buick, GMC and Cadillac set sales records in the country that year. "We appreciate Johan's efforts over the last four years in setting a stronger foundation for Cadillac," said General Motors President Dan Ammann in a release. "Looking forward, the world is changing rapidly, and, beginning with the launch of the new XT4, it is paramount that we capitalize immediately on the opportunities that arise from this rate of change. This move will further accelerate our efforts in that regard." The move comes as Cadillac takes steps to improve its performance in the luxury segment. De Nysschen had overseen a number of efforts to turn the brand around after years of lost market share in the United States. It moved its headquarters to New York City and said it would completely revamp its lineup with 11 new vehicles through 2021. Cadillac has garnered praise for its luxury and high-performance sedans such as the CT6 and the CTS-V, but the brand has missed out on the shift in the market away from passenger cars and toward SUVs. Cadillac has recently attempted to address this shift with crossovers such as the mid-sized XT5 and the new smaller XT4 crossover, which debuted just before the New York Auto Show in March. 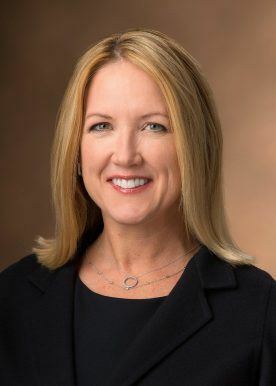 Cadillac also recently appointed a new chief marketing officer, former McDonald's executive Deborah Wahl, in early March. De Nysschen had previously served in top roles at Infiniti and Audi of America before taking the helm at Cadillac. Cadillac has appointed Deborah Wahl as Global Chief Marketing Officer, effective March 26. Wahl will be based in the company’s New York headquarters and report to Cadillac President Johan de Nysschen. Deborah will lead the strategic marketing for the Cadillac brand around the world, building on the transformational work that has been done over the past several years. Wahl, who brings over 20 years of experience with high-level marketing and brand work, serves on the Boards of Directors of Groupon and media software company Mediaocean. She helmed marketing for three years as Chief Marketing Officer at McDonald’s, where she played an instrumental role in transforming the business and increasing brand perception. Previously, Wahl served as the first-ever CMO at PulteGroup, one of the country’s largest homebuilders. Additionally, Wahl brings deep automotive experience, having served as VP and CMO at Chrysler, VP of Marketing at Lexus, and having held multiple Marketing and Communications roles at Ford. Congratulations to Cadillac V-Club member Derek Odell - the Grand Prize winner randomly drawn from a list of all members who attended one of the recent annual holiday banquets. The prize includes a full a tuition paid trip (excluding airfare) to the Cadillac V-Performance Academy in Pahrump, Nevada at Spring Mountain Motor Resort and Country Club. Derek joined the V-Club in 2017 as the owner of a new 2016 Vector Blue ATS-V. This drawing was conducted via Random.org where the names of all eligible members were uploaded to the random.org "drawing app" which randomly selected the winner. 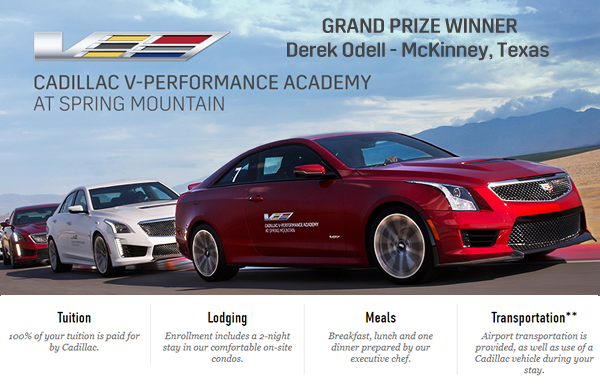 Click here to visit the Spring Mountain Motor Resort and Country Club website to learn more about the V-Performance Academy. 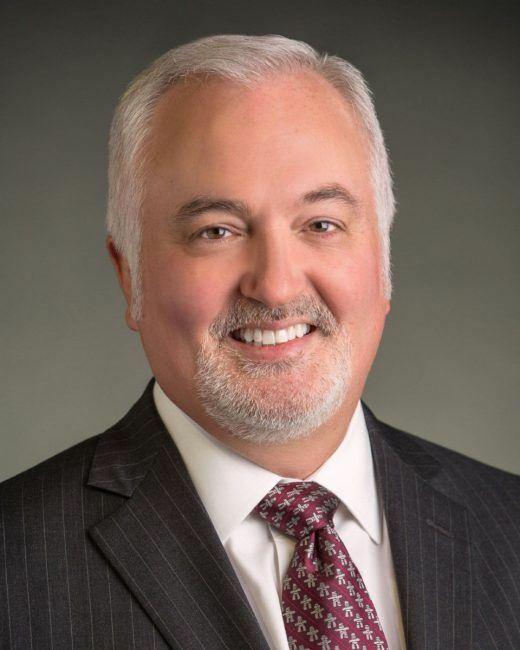 During a recent Texas V-Club board meeting Sean O'Rourke was nominated and accepted the position as Executive Vice President of the Cadillac V-Club during a consensus vote taken by the Board of Directors. Sean joined the V-Club in August of 2014 and in December of 2015 was nominated and accepted the position of DFW Chapter Director. He also recently served in the position as the South Central Regional Director. Sean's leadership was instrumental in the growth of the DFW Chapter which now has 175 members and his background and experience combined with his commitment to the V-Club and the Cadillac V-Series brand make him the perfect choice to fill the position recently vacated by Jay Lane. As was stated in the recent resignation announcement email sent to all members, Jay has been a key contributor to the success of the V-Club as one of the founding members. He will be missed but not forgotten! We wish Jay much success in his new position with Sewell BMW of Grapevine, Texas. Please join us in welcoming our newest sponsors of the Cadillac V-Club, especially Covert Cadillac in Austin, Texas as a Platinum level Cadillac dealership sponsor of the local Austin Chapter. Covert Cadillac Shop Foreman, Dan De Pew who is a 2013 CTS-V Sedan owner and current member of the V-Club recently added "We are excited that we now have a local Cadillac dealership to offer service and support to the Austin Chapter of the V-Club." Located in Newport Beach, California and founded by James Renick, Renick Performance offers premium performance and body enhancement products to give the driver an unforgettable driving experience. They are a group of enthusiasts that desire excellence in parts and service. They aim for client satisfaction and experience compared to none. Renick supports their clients regardless, whether on the street or the track and they are focused on staying a small boutique company to keep quality always at its peak. This is a business built out of our passion for greater engineering and bespoke style. James Renick drives the same vehicle you do, which means he understands the vehicles and understands you expect nothing but the best in sales, service and performance. Located in Fairfax, Virginia, Moore Automotive, Inc. was founded in 1983 by John Moore who had a passion for cars and racing. Mr. Moore raced with some of the best driver’s in the world during his time in the Trans-AM series of the 60’s. In the early 1970’s, he was the Crew Chief for an Indy 500 team. Although his team never qualified for an Indy 500 race, his team’s car is displayed in the Indy Hall of Fame. Also during the 1970’s he worked for Porsche of America. In 1983 Mr. Moore decided to open Moore Automotive in Fairfax City, VA. as performance, tuning, fabrication, and full-service repair and maintenance facility. Moore Automotive prides itself on the result of Mr. Moore’s extensive experience, Moore Automotive became known in the area as a top-notch repair facility. In late 2006, John Moore passed away and the business was sold to its current owners. With a desire to build on Mr. Moore’s love of racing, the new owners of Moore Automotive chose to expand into the import performance market. Today, Moore Automotive is the East Coast’s premiere performance shop with their state-of-the-art equipment, ASE Certified Master Technicians, certified welders, and knowledgeable sales staff. They are dedicated to providing the best customer service in the industry. The V-Club was launched as a Texas corporation in Feburary, 2013. V-Club, Inc. will remain our official business name and effective April 15 a dba was established as Cadillac V-Club to replace the dba of Texas V-Club. After 5 years of sustained membership growth and minimal attrition, the V-Club has now expanded its full membership offering to all Cadillac V-Series owners regardless of their residency. Whether members reside in the continental USA or in another country, there are new levels and classes of membership. There are now six national regions: Pacific Northwest, Pacific Southwest, North Central, South Central, Atlantic Northeast and the South Central region includes the Dallas/Fort Worth, Houston and Austin/San Antonio Chapters. Additional Chapters Chapters will be "chartered" based on the population of V-Series owners in local areas and the availability of local sponsoring Cadillac dealers. A minimum of 15 V-Series owners plus a minimum of 1 sponsoring Cadillac dealer is required before a new Chapter will be launched within a region. In addition, each new Chapter nomination must include a recommended Chapter Director who is committed to serve as the leader and focal point for planning activities and events and recruitment of new members. Each Region within the Cadillac V-Club will be managed by a Regional Director who will champion the growth of each region, collaborate with Chapter Directors and our regional sponsors. Our mission has not changed and continues to be to build and foster the development of a non-traditional "car club" which exemplifies the world class quality and performance of the Cadillac V.
We are currently accepting applications for Regional Directors in each of our Regions. Click here to view the job description for Regional Directors. If you are interested in a position and would like to apply, submit a Contact Request form and provide us a short abstract about yourself and explain why you would like to serve in the position. As members of the Cadillac V-Club you have joined a community of V owners who are committed to the Cadillac brand and love to share their experiences as proud owners of a “V”! By expanding the organization nationally, we will continue to build a network of V-Series owners that will serve as an effective channel for Cadillac to leverage to bring more "V-Performance" awareness in the marketplace at the grassroots level. As a V-Club member, we know you are proud to represent Cadillac and have designed new official apparel and caps so you can wear your Cadillac V-Club branded apparel with pride. Since you drive a "V", you have already experienced the excitement and thrill that ownership brings. With this expansion announcement and continued growth of the V-Club, each member will soon realize additional benefits and have access to a much larger network of V owners and sponsors who can help take your ownership experience to the next level. The story of CTS-V ownership is often one of compromise. Let us explain a little more. A common story with CTS-V owners is that they started off with an LS-powered F-body, or Corvette, or something else and eventually they had kids and had to get rid of it. But the yearning for muscle didn’t leave with it. So they went searching for something “practical” that could still put a smile on their face. Well, for Rick Knetsch and his “Demon” 2009 Cadillac CTS-V, the story goes a little different. Rick grew up racing Volkswagens and was looking for a street beast that could mimic the feeling of a race-style cockpit while being civilized enough for daily driver duties—and he wanted some American muscle. That’s why he took a gamble on a 2007 C6 Corvette and its 400-horse LS2. And while the car had plenty of giddyup, it lacked the musclecar/racecar feeling Rick was craving. So the search for something else to satiate his craving for a street bruiser continued. A buddy of his, who just so happened to live in nearby Laredo, Texas, just so happened to own one of the fastest Corvettes ever produced, a C6 ZR1. Rick managed to talk his friend into letting him take the car for a spin and, after nearly topping the car out, he was smitten. The search for a ZR1 of his very own began. Rick stumbled across an Atomic Orange example in Fort Worth and was scheduled to go take a look at the car the following weekend. However, as fate would have it, Rick’s ZR1 friend gave him a ring to let him know that there was a clean CTS-V for sale in his neck of the woods that he needed to check out. Since there was no reason not to go drive the car, since it was nearby, Rick decided he’d give the car a whirl—though he was skeptical that the sedan could provide the feeling he was really searching for. That all changed as soon as Rick climbed behind the wheel. The trouble Rick is referring to turned out to be five broken valve springs and seven bent valves. Just four months into owning the car, the top end of the motor was completely destroyed. Luckily for Rick, all of the valve spring retainers held and prevented even more damage to the bottom end of the LSA. Rick was about to run into more bad luck too as the original owner, and modifier, of the CTS-V was now sitting in jail for street racing. This left Rick with only a vague idea of what components where actually on, or in, the motor. So, he dove in head first and described the process to us as almost like a treasure hunt. It turns out the previous owner had an aggressive LG Motorsports camshaft that had been poorly matched with the valve springs by the previous owner. This lead to the premature valve spring failure and the destruction of many components. But, like any true gear head, since the engine was apart it was time for upgrades. The valves were replaced in the stock LSA castings, which were then ported and polished by the guys at Texas Speed & Performance . The TVS1900 supercharger was also port matched to the heads to take advantage of the newly found flow. A 9.55-inch Integrated Motorsports lower pulley was added to a 2.85-inch upper pulley for a total of 13 pounds of boost pressure. The plan was originally to convert the car over to E85 to take advantage of the increased power that it presents in boosted applications, but unfortunately for Rick the corn-based biofuel isn’t readily available where he lives. Nevertheless, the CTS-V was already making good power once it was back together and its main problem was traction. Rick tried running the car with drag radials on the stock wheels, but that combo just wasn’t doing it. A set of Weld wheels and a tire with a little more bite were in order. Rick dialed up Tyler at Mont Motorsports and order a set of Weld S71B wheels and wrapped them in M&H Front Runners up front and Mickey Thompson ET Street R drag radial front and rear respectively. After a few tire combos and getting a feel for the car, Rick recently drove the car to a 10.84 at 127 mph. Not too bad for a full interior sedan. And even more impressive when you watch a 4,000+ pound car yank the front tires coming off the line. This shot is from Rick’s best run of 10.84 at 127 mph. An impressive feat, to say the least, considering the car has 100 percent stock suspension on it as well as the stock torque converter driving the stock 6L90E transmission. That means Rick is leaving the line at 1700 rpm and still managing to get the tires in the air. But the story doesn’t end there. While the car has a lot done to it, there is still plenty left to do according to Rick. The car is currently setup for a 100 shot of nitrous via a Zex single nozzle wet shot system, which should carry the car well into the 10s. The car isn’t lacking in the looks department either. The stock hood was ditched in favor of a D3 replica hood and the car’s original black hue was changed over to a flat red—not a common color for a V, but Rick says that was one of its biggest draws. Initially, Rick wanted to paint the car but knew that he had a propensity to not like the colors he chooses for extended periods of time. Since he wanted something that wasn’t permanent, he decided to Plasti-Dip the car—which he accomplished himself. But the color it ended up was not the color Rick intended. The compliments encouraged Rick to keep the color for a while, but eventually he grew tired of it and began to search for something he’d be more happy with. A friend of Rick’s volunteered to help him prep and spray the car in what ever hue he wanted, so the car headed back to paint. Rick told his wife that he wanted the color to be “demony”, hence the cars signature moniker. Initially, they mixed red and black together to try to get the menacing red Rick was looking for, but he was still unhappy with the color. That’s when he came across Carbon Lava, which had a vaguely orange tinge to it. Once that was added, it was nearly perfect, but Rick said he threw in a few more splashes of different colors to give the car its signature look—good luck paint matching it if it ever gets scratched. To match the beautiful exterior, Rick had all of the piano black trim panels hydro dipped with a mural of engine parts while the rest has been wrapped in carbon fiber. This gives the car a unique look whether you’re inside or out. And while the car is gorgeous as well as fast, Rick said that he credits his great love of Vs to the men and women of the Texas V Club—of which he is the San Antonio Austin director. He said that the sense of community he feels within the club is like nothing he’s ever experienced. So, the next time you are out in the San Antonio Austin area, we hope you bring an exorcist with you. If not, this badass V just might make your night a living hell. Joe Dean - DFW Chapter - Cadillac V-Corral/VIP Suite ticket package for two to attend the Lonestar Lemans IMSA event where the new Cadillac DPi-R race car will compete. Steve Whitaker actually won the prize but had a travel conflict with the date and donated his prize to V-Club Joe Dean. Patsy Miller - Austin/San Antonio Chapter - Cadillac V-Corral/VIP Suite ticket package for two to attend the Lonestar Lemans IMSA event where the new Cadillac DPi-R race car will compete. Tom Eadie - Houston Chapter - DFW Chapter - Cadillac V-Corral/VIP Suite ticket package for two to attend the Lonestar Lemans IMSA event where the new Cadillac DPi-R race car will compete. Congratulations to all prize winners and a special thanks to Cadillac Hqs and Sewell and Ken Batchelor Cadillac for contributing to these success of our annual holiday celebration events.